Bali is an interesting place. There is a lot of cultural richness within the local Balinese community. Balinese culture is widely packed as a cultural attraction that is very popular by the wider community. 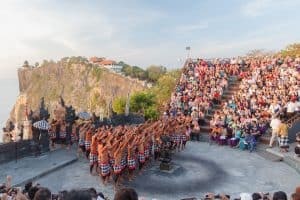 People from abroad come to Bali just to enjoy and learn about the series of traditional ceremonies owned by Bali people. Here are some traditional ceremonies in Bali. Ngaben ceremony is a funeral ceremony in Bali. When people are dead, corpses are required to be purified by the medium of fire ie burned to ashes. Ash from the burning of the corpse washed away in rivers or oceans. The purpose of this burning ceremony is the purification of elements of the soul and body. Ngaben must be done by the people of Bali. In addition, the ceremony is also to sincere families who are left dead. Lots of tourists who come to see this Ngaben procession. Trunyan village is known to have a unique tradition. They do not burn or bury the corpses of the dead. But the corpse is only placed next to the tree. But the trees that are here not just any tree. Namely Taru trees and sedan that is able to remove the enzyme and smell of fragrant. So when the corpses of people who have died when placed around the tree will not smell bad, even smelled fragrant. Ngurek ceremony is almost similar to debus. The perpetrators involved in this ceremony must pierce his body by using a dagger. The purpose of this Ngurek ceremony is the human must oblige with God Almighty. When man has been convinced to be born in the soul then there will be help in the form of grace and blessing from the Power to man. Melasti ceremony is a human cleansing ceremony and its life. Before Nyepi, it is obligatory to pray on the beach. The evil and bad elements of humanity will be thrown out and thrown into the ocean. Melasti ceremony is a ceremony that serves to purify people who always have sin because humans are not perfect beings. Humans often make mistakes and blame even sins so that this Melasti ceremony is indeed done for that purpose. So man will be born again clean both soul and body back after Melasti ceremony is done. The ceremony is called Omed – Omedan because it means attracting each other. In the core activities of Omed – Omedan Ceremony, the participants involved in the ceremony are pulled and raised to kiss each other. The one who has the right to practice this kissing tradition is the man who is picked up by the other with the woman who is picked up by the others. This tradition is done for the purpose of friendship, joy together, as well as to reject disastrous for people who believe it. Mepandes ceremony is a Balinese traditional ceremony performed for the cleansing of man. 6 canine teeth on the human jaw that began to mature leveled or filed flat. The goal is to eliminate bad and evil elements. The crime is symbolized by the 6 canine teeth owned by the human just before adulthood. Tumpek Landep Ceremony is a Balinese traditional ceremony where weapons and equipment owned by Balinese people are purified with offerings and prayers. Once collected and blessed by traditional leaders, it is hoped that weapons and community equipment can be used properly. The weapons are capable of bringing blessings in the daily life of the owner. Usually the collection of weapons and community equipment is done in the temple. Pura is chosen as the right and sacred location for giving blessings to their weapons and their daily tools. Mesuryak ceremony is done by throwing money upwards after Galungan day. Precisely held on the day of Brass or 10 days after the day Galungan. The purpose of this ceremony is offering or providing supplies to the ancestors of the Balinese community. On Galungan day, they come down to earth to bless their children and return to nirvana on the day of Kuningan. Pandan War ceremony is also called Mekare – kare. The ceremony is done by smashing the pandan leaves with each other to be offered and addressed to Dewa Indra. Dewa Indra is the God of War for ancient Balinese people. Strangely, the participants of this ceremony did not feel the pain of pandanus spines even though blisters and bleeding. After the ceremony is over they will be treated and purified also by customary leaders and pastors who lead the ceremony. This ceremony is a form of togetherness and kinship of the people of Bali. Communities are gathered to eat together in one container. The next ceremony you can meet when in Bali is Saraswati. Unlike Ngaben which is a ceremony for death, Saraswati is a ceremony to celebrate science. This ceremony is performed to worship or glorify Goddess Saraswati who is believed to bring science on earth. So that makes everyone in the world become smart and educated. At Saraswati ceremony usually all things related to science such as books will be prayed for. The event also contains dance performances such as dance, story-reading, until the evening of literature for a whole night. The Saraswati ceremony is held 210 days on Saturday Umanis Watugunung. Balinese ceremonies aimed at welcoming the birth are classified into three stages. Namely the common folk, the nobility, and the Bali Aga. In the common folk class, the birth ceremony begins with the Mara Lekat ceremony. Mara Lekat ceremony is a birth ceremony that explains about the cutting of the placenta called Kepung Pungset. Then linked to a Hawon Release ceremony that explains the ceremony 12 days after the baby is three months old. At the time the baby enters childhood a welcome ceremony is held. For the nobility of ceremonial stages the same as ordinary people only use other names, namely Rare Mapak, Wawu Mijil, Kepel Udel, and Awong Awepas. Meanwhile, for the Bali Aga class the term is, Tapakan, Kepus Sawen, and Nelu Bulanin which is added with the ceremony Ngetus Jambat (shaving hair). At this ceremony the first time a child experiences contact with religion and tradition. That’s what will guide them for life. On that day the child is named and blessed, and may step on the ground, as a symbol of the gods, namely Brahma, Vishnu, and Shiva.